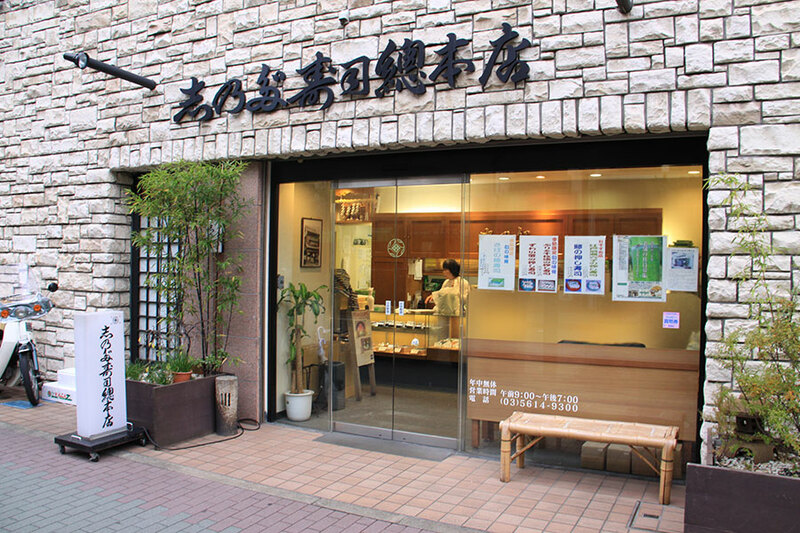 Today we’ll visit the Ningyocho Shinodazushi Sohonten which was founded in 1887. When you think of “sushi,” nigirizushi may come to mind, but this shop specializes in two types of sushi called inarizushi and Osakazushi. The first generation owner was a samurai from the Hiroshima Domain who was working in Edo, which later became Tokyo. It is said that when he stopped working as a samurai during the Meiji Restoration, he opened an inarizushi stand in Ningyocho. In the Meiji Period (1868 – 1912), there were a number of theater playhouses around this area and it was a bustling town, so the inarizushi stand was a big hit then. Even now, Shinodazushi’s oinarisan and Osakazushi are very popular. Right, I also love those. Hello. I’m Takahiro Yoshimasu, the owner of Shinodazushi. Hello. I’ve eaten oinarisan from this shop before coming here today, and I have to say that it’s still very delicious. Maybe it’s because of the nice balance between the rice and fried tofu. Even though it has a robust taste, it’s not overly strong, so you can eat lots of it without getting tired of it. I suppose each generation has maintained this flavor over the generations, right? Yes. Ever since the shop’s establishment 140 years ago, we’ve continued to make it by hand, and the size of the sushi and the way we make it hasn’t changed much since those times. 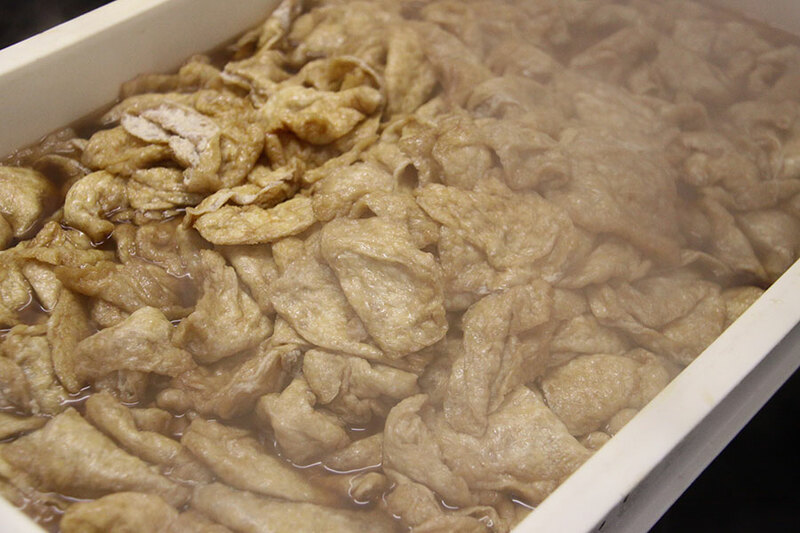 For the fried tofu, we use something that is thinner and absorbs flavor more easily than the usual kind, which is made by a tofu shop that we’ve had a long association with. 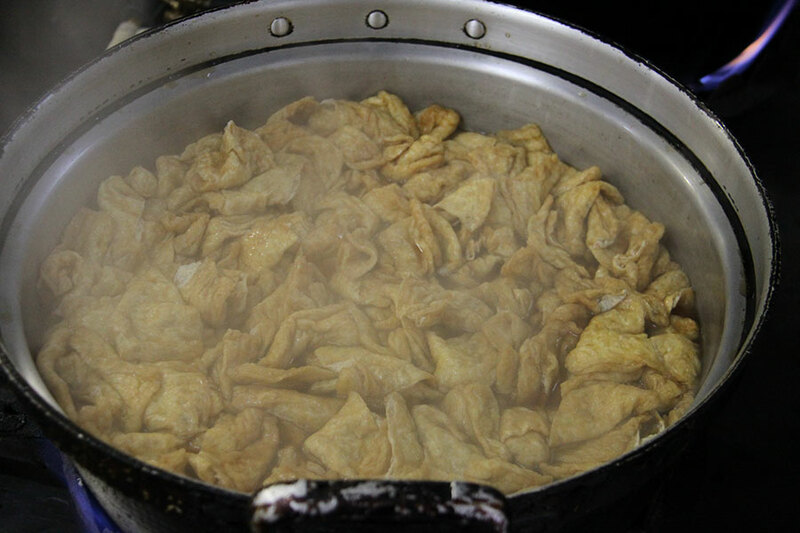 We boil the fried tofu in a large pot with water, and then the real work starts with removing the oil. But if you take out too much oil, it won’t be tasty. That looks like something that anyone can do, but I heard that it actually takes many years of training to do it right. Yes, that’s right. Our workers are busy working while constantly attending to the pots and checking on them. After removing the oil, the fried tofu is finally simmered in a sweet and salty sauce. It’s simmered with water, sugar, soy sauce and mirin. We mix three types of sugar: white sugar, brown sugar and Okinawan brown sugar. By blending three types of sugar with different characteristics, we produce a deep flavor. Then after the simmered fried tofu is left to marinate in the sauce for three days, it’s finally ready to use in the inarizushi. Is marinating it for three days some technique passed down from previous generations? No, before my generation, it was marinated for only for a day. I changed it after I took over from my father. 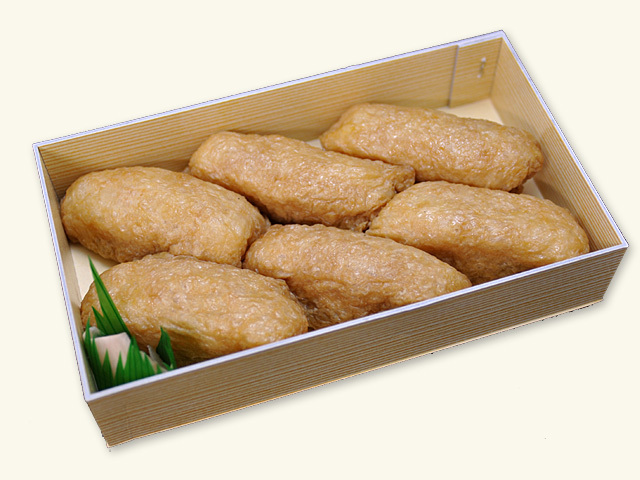 Compared to when the shop was first established, the ingredients of the fried tofu such as soybeans and oil, as well as the rice and vinegar for the sushi rice are all different. For customers to be able to continue to enjoy the delicious flavors just as they did in the old days, it’s better that we make changes like this. I see. 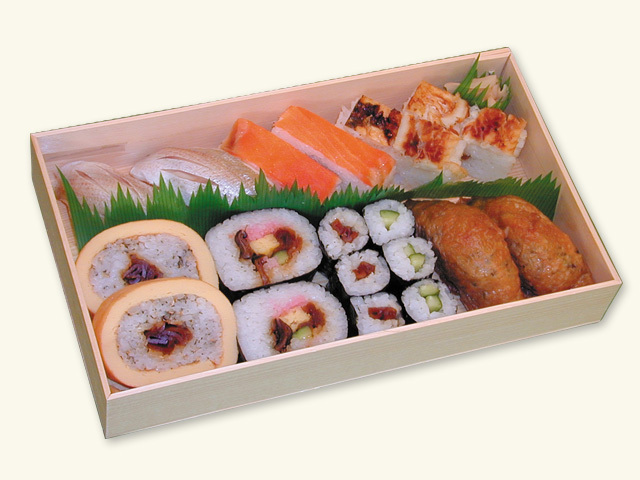 So to get a feeling of the flavor, do you go around to other shops and try their inarizushi as a reference? No, I want everyone to know the taste of Shinodazushi, so I never eat inarizushi from other shops. If I do so, I think my sense of flavor will unconsciously be influenced. Oh, you don’t eat other inarizushi at all?! People these days don’t eat inarizushi, Osakazushi or hakozushi like they did in the past, so times are rather difficult. But for me, if customers don’t think that the sushi meets their expectations or is behind the times, they stop coming. And if there’s no demand, then it’s best for this shop to close its doors. I’ve heard that that was a characteristic of the old Tokyo folks, so I guess it’s only natural to see it in the sushi’s form and flavor. Even now, the traditional downtown atmosphere of old Tokyo is alive and well in Ningyocho, and so that’s probably why so many people come here to enjoy that. The shopping streets look really lively here. That’s actually not entirely true. This area also faces such problems of an aging population and declining birthrate, and private shops are closing down one after another. If they don’t have a successor, the shop has no choice but to close, and the number of franchise shops is gradually increasing. 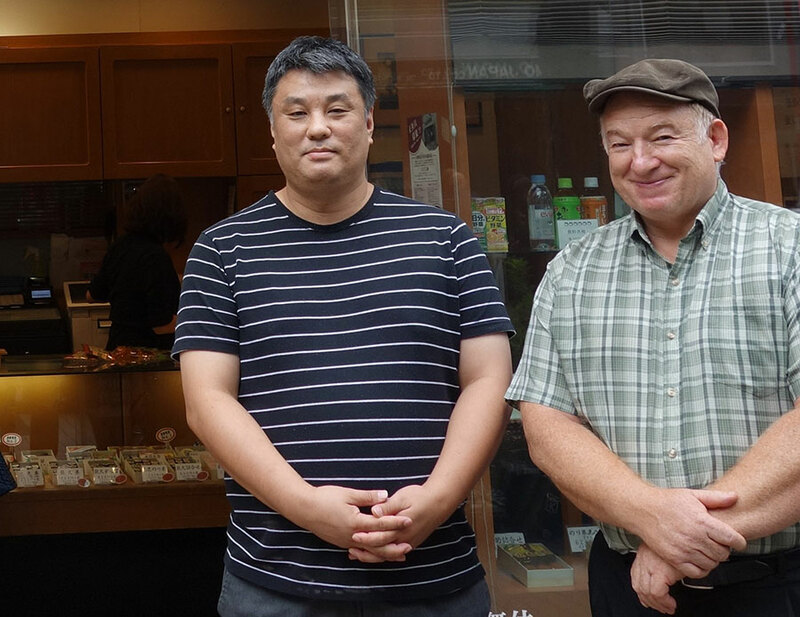 Today, I was able to hear a lot of really fascinating stories, and I learned a lot! But the Shinodazushi sushi is too delicious to ever let go away―it’s amazing! It looks like again today things are getting busy with customers coming by one after another. Thank you very much for talking to us during such a busy time.